Thanks to an army of great and critically acclaimed mystery writers, the Scandinavian country of Sweden is, in 2018, synonymous with murder. Outside of the printed page, Sweden is far from the world’s most violent place. 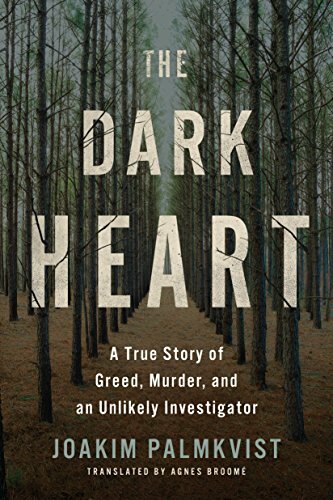 However, murders do occur, and journalist Joakim Palmkvist’s The Dark Heart examines one shocking murder that captured the minds of the Swedish public from 2012 until 2014. Set in the rural county of Kalmar on the southeastern coast, The Dark Heart tells the story of the strange goings on at the farm owned by the prosperous Lundbland family. In the summer of 2012, family patriarch and multimillionaire Goran Lundbland was reported missing by his youngest daughter, Maria. relationship with her miserly father. More to the point, before he went missing, Goran made no secret that he loathed Sara’s boyfriend, the neighbor Martin Tornblad. Martin’s family was in dire financial straits in 2012, and Goran suspected that Martin’s affection for Sara was really based on his covetousness. Martin and Martin’s family wanted their hands on the Lundbland fortune, Goran suspected. Palmkvist provides every melodramatic detail about the tawdry relationship between Sara and Martin, plus he provides plenty of information about Goran and the whole Lundblad clan. The Lundblads made their money through old fashioned means (owning and cultivating land) and novel ones (holding a patent on and manufacturing a type of smoking pipe). Goran, like his parents, was obsessed with money, specifically saving as much money as possible. This put him on a fatal course against the greed of those closest to him. The other major character in The Dark Heart is Therese Tang, a veritable Renaissance woman. Despite dropping out of high school due to becoming pregnant at 18, Tang somehow managed to be an international fashion model and later a private security guard before turning 35. On top of this, Tang worked for years in a family-owned Chinese restaurant and worked as a stylist and photographer. At the conclusion of The Dark Heart, the brave and self-reliant Tang is the one who cracks the case and brings the murderers to justice after two long years. The Dark Heart is an extraordinary examination of a rather ordinary crime. The killers in this case were motivated by the ancient sin of greed, and their methods only managed to confound the police for so long because Goran’s body could not be found. Rather than a book about a fascinating crime, The Dark Heart is so entertaining because of the people involved and the setting. From the 19th century-esque High Lutheran Church conservatism of the Lundblad’s to the boundless moxie of Tang and her fellow private eyes, The Dark Heart is such pleasurable reading because it is chock full of such fascinatingly rich people.